This course is designed to give responsible personnel up-to-date knowledge that will assist them in developing a sustainable municipal stormwater management program. Programs developed using the information in this workshop will have the ability to meet compliance for stormwater concerns today as well as for water quality and quantity in the future. Attendees will review and discuss new federal policies and initiatives that are causing a re-evaluation of the current National Pollutant Discharge Elimination System (NPDES) permit structure and existing stormwater management programs. In addition, the instructor will present best management practices (BMPs) and examples of program implementation in municipalities. Discussion will focus on management of source inputs from construction, industrial, and commercial properties that have direct impact on municipal stormwater management programs. Monitoring stormwater discharges from private and municipal systems establishes a baseline for policy and program development, and budgeting for capital improvements requires accurate data. Sampling protocols and methodologies are important to evaluate for several reasons: to ensure that replicable data is being generated, to accurately assess water quality, and to determine the most effective and efficient BMP approach. As other drivers such as sediment management standards, total maximum daily loads (TMDLs) and fish consumption rates lower permit parameters, it is important to evaluate advanced treatment technologies and methodologies to achieve water quality anti-degradation requirements. 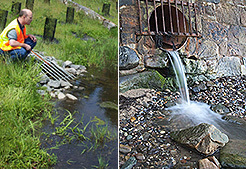 One such strategy involves an ecological approach to stormwater management. The movement towards low-impact development (LID) is causing municipalities to better understand pollutant removal capabilities and consider flow dynamics of LID BMPs to manage discharges within their jurisdiction. “Greening” the urban landscape provides a sustainable alternative to hardscape infrastructure. It has multiple socioeconomic benefits and is often more economically viable than traditional approaches. These and other modern techniques and strategies for stormwater management will be introduced in this course. This course is part of the Midwest Water and Policy Workshop Series. Attendees will receive an additional $50 discount off their order when registering at the same time for "The National Environmental Policy Act (NEPA): Writing the Perfect EA/FONSI, or EIS" or "The Ecological Significance of High Flows on Alluvial Rivers". Registration: *Reduced tuition is available for Native American tribes, government employees, nonprofits, students and NAEP, NEBC, NWAEP members. You may register online or by calling the Northwest Environmental Training Center at (425) 270-3274. Online registration is strongly encouraged. Attendees will receive a binder containing workshop proceedings and reference material. Personnel responsible for the planning and implementation of municipal stormwater management programs.